This prehistoric-looking veggie used to terrify me (maybe because I imagined giant veloci-rabbit-raptors ripping into the leaves). 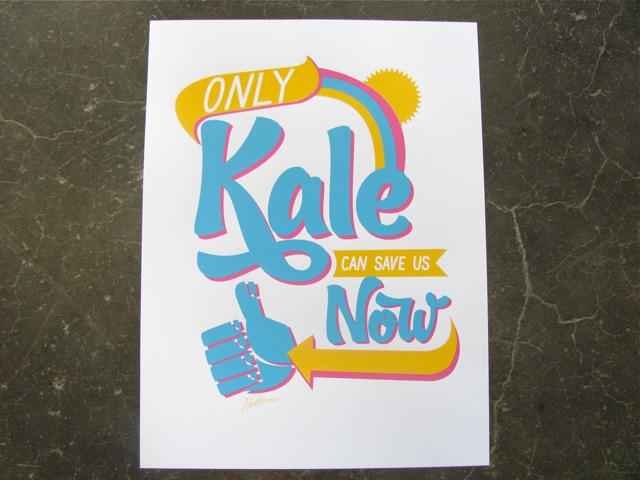 Now I regard it as King Kale, ruler of the Aggregate Nutrient Density Index, or ANDI. 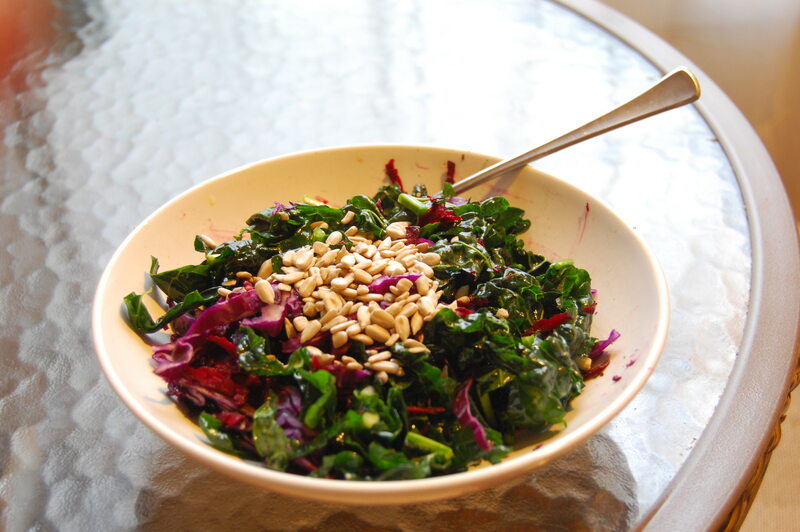 Full of vitamins A, B6, C, K, calcium, potassium, and iron, kale is one of the sexiest/healthiest veggies out there. Separate the leaves from the stem, using a knife or your hands. Chop the kale finely, put it in a large bowl, and add a tablespoon or two of olive oil, a dash of salt, and a squeeze of lemon juice. Then squeeze and rub the kale until it’s tender and dark green (about 1 minute). My grandma never gets tired of making jokes about how the kale really needed that massage after a hard day of work. Next, grate the carrot and beet into the salad. I know it’s tempting to chop instead of grate, but trust me, grating makes all of the difference. Add in some chopped avo and sunflower seeds and toss with your favorite dressing (I like Drew’s Poppyseed), and you’re done! *BONUS* Making this salad is also like a mini-spa treatment! Once you’re done massaging the kale, rub the olive oil & salt on your hands for a quick DIY salt scrub. This recipe is even easier. De-stem the kale, throw all of the ingredients into a blender (doesn’t need to be a fancy-shmancy VitaMix), and voila! A delicious mix of protein, calcium, iron, Omega-3’s and potassium all in one glass.